On 26 June, 2012, Mgr. Serge Thériault, primate of the Christian Catholic Church of Canada (Eglise catholique chrétienne) issued a public Statement concerning this jurisdiction that contains a number of false and misleading assertions. We take the opportunity here to set the record straight so that there is no uncertainty as to the true facts of the case, which are amply evidenced on our website and through our previous writings concerning the Abbey-Principality of San Luigi. In order to examine Mgr. Thériault’s claims, we should first turn to the book which he has published that sets out his case, and from which material has been extracted that has appeared on the website of his church. The book in question is “Msgr. René Vilatte: Community Organizer of Religion, 1854-1929” published in Berkeley, California, by the Apocryphile Press. The edition referred to, believed to be the most recent, is that of 2006, which is listed as an updated and revised version of the original 1997 imprint. On p. 150, under the heading “Abbot of San Luigi”, there is a reproduction of part of the history of the foundation of the Abbey-Principality of San Luigi in 1883, and its subsequent history in Bunyoro-Kitara and France, extracted from the 1922 “History and Regulations” published by Mgr. Vilatte. On pp. 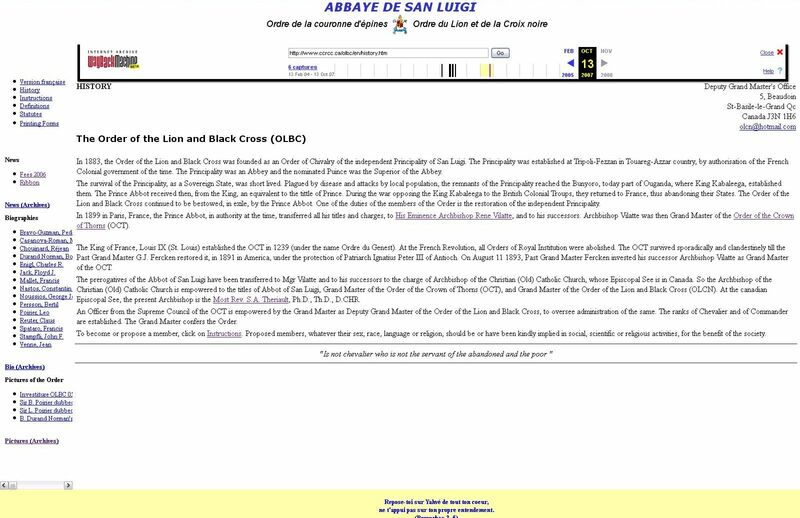 150-51, under the heading “Order of the Lion and Black Cross (O.L.B.C.) there is an account of the creation of the Order by Dom Henrice, first Prince-Abbot of San Luigi, in 1883, and its aims and insignia. 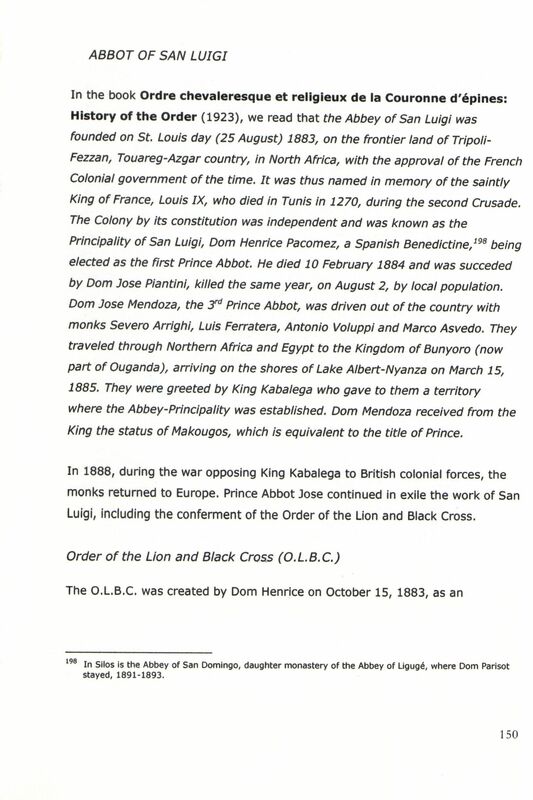 On p. 151 there are reproduced the insignia of San Luigi, of the Order of the Lion and the Black Cross, and a photograph of H.M. (incorrectly designated H.R.H.) Omukama Chwa II Kabalega of Bunyoro-Kitara. On p. 151 there is an account of the transfer of the titles and charges of the Abbey-Principality to Mgr. Vilatte and of its uniting with the Order of the Crown of Thorns (O.C.T.) in 1899. On p. 152 there is a list of persons admitted to the O.L.B.C. with photographs. On p. 153 there is an account of San Luigi House, established in Paris by Mgr. Vilatte as Prince-Abbot. On p. 252 are reproduced the Statutes of the O.C.T. published in 1893 under Mgr. Vilatte. “1883 The Abbey-Principality of San Luigi is established in Fezzan, Touareg country (at the frontier between Lybia and Algeria, close to the city of Tripoli). The Abbey-Principality is an independant and sovereign state. Dom Henrice Pacome is 1st Prince Abbot. 1884 Dom Jose Pialini is 2nd Prince Abbot. 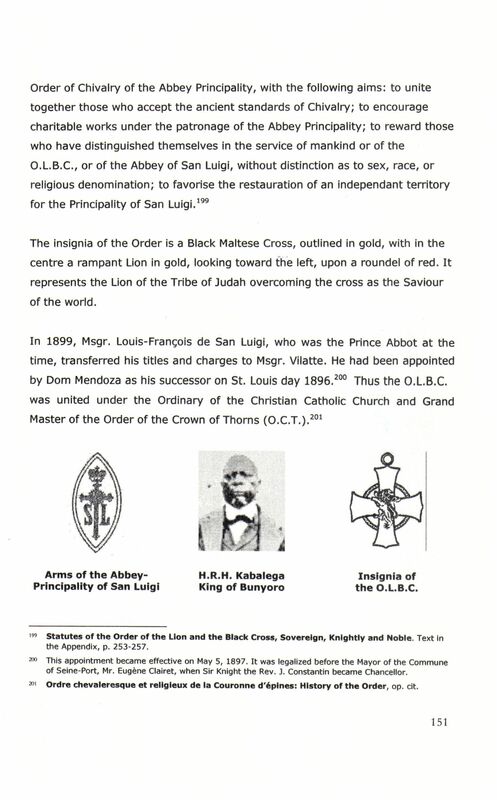 Under his leadership is created in the Princedom the Order of the Lion and the Black cross (OLBC). Dom Pialini is 1st Grand Master (G.M.) of the Order. The Principality is attacked by Muslims who drive the Abbot and his people out of the country. 1885 Dom Jose Mendoza is 3rd Prince Abbot of San Luigi and 2nd G.M. of the OLBC. Omukama (King) Cwa II Kabalega of Bunyoro ( now part of Ouganda) welcome him and his people, and gives permission for the establishment of the Princedom in Bunyoro Kitara. Omukama Kabalega gave to Dom Mendoza the title and jurisdiction of Makougos, what means Prince-Governor. King Kabalega had succeeded King Kamurasi in 1869. 1892 Dr. J. René Vilatte, first Bishop Ordinary of the Christian Catholic Rite of Community Churches (CCRCC) is consecrated on May 29, by the Syrian Orthodox Church in India (Patriarchate of Antioch). 1893 On May 30, Bishop Vilatte is installed as G.M. of the Order of the Crown of Thorns (OCT) by Passed G.M. Gaston J. Ferken, who transfers his jurisdiction to him and his successors in the episcopate of CCRCC. Passed G.M. Ferken had received his authority of G.M. from His Holiness Ignatius Peter III, Patriarch of Antioch and the East (1890). 1896 Dom Louis François de Girardot succeeds Dom Mendoza as 4th Prince Abbot of San Luigi (Mukagos in Bunyoro Kingdom) and 3rd G.M. of the OLBC. “In 1883, the Order of the Lion and of the Black Cross was founded as an Order of Chivalry of the independent Principality of San Luigi. The Principality was established at Tripoli-Fezzan in Touareg-Azzar country, by authorisation of the French Colonial government of the time. The Principality was an Abbey and the nominated Puince [sic] was the Superior of the Abbey. The survival of the Principality, as a Sovereign State, was short lived. Plagued by disease and attacks by local population, the remnants of the Principality reached the Bunyoro, today part of Ouganda, where King Kabaleega, established them. The Prince Abbot received then, from the King, an equivalent to the tittle [sic] of Prince. During the war opposing the King Kabaleega to the British Colonial Troups, they returned to France, thus abandoning their States. The Order of the Lion and of the Black Cross continued to be bestowed, in exile, by the Prince Abbot. One of the duties of the members of the Order is the restoration of the independent Principality. These examples, of which many more instances could be cited, serve to prove that Mgr. Thériault has openly endorsed the main principles of the commonly-agreed history of the Abbey-Principality in its pre-1925 period. Indeed, he gives us to understand that his book is a work of scholarship and that its basis is that of historical research. Although we certainly differ from him in the conclusions he draws from that research, we find no obvious error his citation of the relevant documents concerning this early period, nor does he at any point suggest that the material he cites is open to doubt. That this should be the case is not surprising, since the book seeks to draw a series of increasingly far-fetched conclusions in order to support Mgr. Thériault’s own claim to be the Prince-Abbot of San Luigi and to confer the San Luigi Orders validly. His claim is, in brief, divisible into two main elements. The first is that the church he leads, the Christian Catholic Church of Canada, is the successor body to the Old Catholic Church of America founded by Mgr. Vilatte at his consecration in 1892, and to the Christian Catholic Church founded by Mgr. Charles Chiniquy in 1859 in the State of Illinois, USA. The second is that his church has been led by prelates who have been Prince-Abbots of San Luigi, of which he is the most recent. Let us examine these proposals in turn. The Christian Catholic Church of Canada was, according to the book referenced above, first incorporated in that country as a religious corporation in 1980 (p. 24). On 31 January 1988, we are told that the church trustees re-established the “Pastorate of Ontario” “founded in 1900 by Msgr. Vilatte” (p. 212). On 14 June 1998, the Order of the Crown of Thorns was “reconstituted” by resolution of the corporation (p. 26). It is unnecessary to make further citations in order to establish that what we are dealing with here is not a historically continuous jurisdiction with canonical and corporate succession from the original church, but instead a modern revival movement. Such a body may declare whatever it will – be it that its head is heir to San Luigi or indeed successor to the See of St Peter – but its declarations have the authority to bind only its own members and have not the slightest effect on any other party. The only jurisdiction that has been recognized by competent authority as the direct and canonical successor to the Old Catholic Church of America, with which the jurisdiction of Mgr. Chiniquy was joined in 1894, is the Apostolic Episcopal Church. On 7 June 1946, a Patriarchal Bull of the Prince-Catholicos of the Catholicate of the West declared that the Ancient Christian Fellowship (The Old Catholic Church of America) led by Archbishop de Ortega Maxey was “the only lawfully constituted body in continuance and in continuity with The Old Catholic Church of America erected by the consecration of the Most Revd. Joseph-René Vilatte in 1892” (ACF Review no. 1.4, Oct.-Dec. 1946, pp 12-13). Archbishop de Ortega Maxey was ordained priest by Mgr. Vilatte in 1923. By instrument of 31 July 1946 (ACF Review no. 1.4, Oct.-Dec. 1946, pp 3, 6-7) the Ancient Christian Fellowship (The Old Catholic Church of America) merged with the Apostolic Episcopal Church. The present Prince-Abbot has since 2015 served as Primate of the Apostolic Episcopal Church and therefore also of the Old Catholic Church of America that is merged within it. He is in the direct Apostolic Succession not only of Archbishop Maxey but of all his predecessors as Prince-Abbots of San Luigi including Mgr. Vilatte. Mgr. Thériault claims (p. 209) to have received the Apostolic Succession in succession from Mgr. Vilatte via Mgr. Peter Wayne Goodrich, Primate of the Independent Anglican Church (Canada Synod), at a time when that prelate was a bishop of the Liberal Catholic Church (International). This in turn rests on claims of the transmission of the Vilatte lineage to Archbishop Carmel Henry Carfora, Primate of the North American Old Catholic Church, and other bishops of his jurisdiction. Contrary to the practice and understanding of the ecumenically-based and somewhat Anglican-influenced churches such as the Catholicate of the West and the Apostolic Episcopal Church, which hold (following Resolution 9 of the 1920 Lambeth Conference) that conditional consecration is a means towards the reunion of Christendom, Old Roman Catholic denominations believe, in accordance with their strict pre-Vatican I polity, that the only purpose of conditional consecration is the remedying of defects in the original ceremony that might cause its validity to be in doubt. Thus all clergy of the Vilatte succession who were accepted into the North American Old Roman Catholic Church under Carmel Henry Carfora (and indeed Archbishop Carfora himself) were conditionally re-ordained or re-consecrated in order to impart unquestionably valid orders, not simply to confer additional lines of succession upon them. As a result, any claim of a Vilatte succession that is made through Carfora and his clergy must be discarded for the simple reason that those clergy themselves were required to believe that the only valid orders they had received in any operative sense were those of the Mathew succession that had been imparted within the N.A.O.R.C.C. ; thus these bishops would neither have held that they possessed the Vilatte succession, nor that they could transmit it to others. The various branches of the Liberal Catholic Church similarly do not practice or recognize conditional consecration for ecumenical reasons. Nor are these the most glaring errors in this unhappy saga. The claim is made by Mgr. Thériault that bishop Casimir François Durand succeeded Mgr. Vilatte as second ordinary of the Christian Catholic Church (p. 26). As stated above, no such-named corporate body had any legal existence in Canada until 1980, over twenty years after Mgr. Durand’s death. Had Mgr. Durand been told that he held such an office, one can imagine him to have been greatly surprised! In a specious attempt at an explanation, Mgr. Thériault seeks to claim that “Old Catholic”, “Christian Catholic”, and similar terms were used synonymously within his church without apparent distinction between them in the period before 1983 (p. 28). Such an “identity crisis” is hardly convincing when claims of historical continuity are being put forward. Together with this office, it is stated, goes that of Prince-Abbot of San Luigi. This again strains credibility, especially given that no evidence is produced that Mgr. Durand claimed that office or bestowed the San Luigi Orders. Indeed, it would have been most unlikely that he would have done so, since they were at the time highly active under our predecessor Prince-Abbot Edmond I (Barwell-Walker), who was the duly appointed and recognized successor of Mgr. Vilatte in their jurisdiction. In a document dated May 25, 1923, preserved in the archives of St Ephrem’s Institute, Solna, Sweden, and a copy of which can be found here, Mgr. Vilatte appoints Mgr. Barwell-Walker to be his successor in the Order of the Crown of Thorns and its related authorities, upon his death. The document is signed by Mgr. Vilatte personally, sworn before a notary public, and is all that is ultimately needed to prove that Mgr. Thériault’s claims as regards the San Luigi Orders are entirely false and baseless. This is a misleading conflation. Firstly, it implies that Mgr. Durand succeeded Mgr. Vilatte in 1926, some three years before the death of the latter and in the year after he had reconciled with the Holy See. This is unsupported by any evidence whatsoever of such a transmission, let alone any reference to the actual succession we have evidenced above. Next, note that Mgr. Durand’s consecration took place in 1926, which is not made clear in the text above. He was an assistant priest, not the assistant bishop to Mgr. Vilatte at the consecration of Mgr. McGuire in 1921: the assistant bishop was Mgr. Carl Nybladh. Furthermore, the 1938 appointment of Archbishop Alexander was made by our predecessor Prince-Abbot Edmond I (Barwell-Walker), not by Mgr. Durand, and is well-documented by correspondence between the two men that resides today in the archives of the African Orthodox Church in the Pitts Theology Library at Emory University. The fact is that Mgr. Durand was simply a junior bishop of the American Catholic Church. There was no formal appointment of him as “bishop for the French-speaking constituency” as Mgr. Thériault claims, placing wholly undue weight upon a 1928 passing mention of him in the context of the national origins of other ACC bishops (p. 260). If, as Mgr. Thériault tells us, Mgr. Durand claimed to be Presiding Bishop of the ACC in 1940, it was without the consent of any of the other bishops of that church and – in violation of the canons – without any election as such. Indeed, Mgr. Thériault says that an officer of the ACC suggested to Mgr. Durand that he should simply assume the primacy, whereupon he did so (p. 208). All the valid bodies that succeeded upon the division of the ACC into separate jurisdictions in 1940 were properly constituted dioceses of that church that had ceased to operate under a single aegis (and all of which continue to exist today). By contrast, Mgr. Durand’s work appears to have been rather more of the nature of a personal ministry. Moreover, if Mgr. Durand were supposedly the leader of this Christian Catholic Church of Canada, and indeed of the American Catholic Church, we must note that he died without consecrating or appointing any bishop as his successor. His assistant, a priest, Fr. Baudot, died in 1974, again without any apparent disposition of the jurisdiction. The absence of any jurisdictional link between these clergy and Mgr. Thériault must place his claims to be their successor in severe doubt. Turning to Mgr. Thériault’s consecrator, Mgr. O’Neill Côté, we find that he is described as founding in 1970 a ministry described as “The Burning Bush” that is claimed by Mgr. Thériault to be a ministry “that restored the C.C.C. to its present form” (p. 209). Nowhere is it shown that Mgr. Côté claimed to be or was accepted as the canonical and jurisdictional successor to Mgr. Durand. At the time of his consecration, he was a member of the Liberal Catholic Church (International), as was his jurisdiction, and was consecrated for and by that church as its bishop in Québec (cf. copy of consecration certificate). The L.C.C.I., which we encountered previously in the context of Mgr. Goodrich, is a Mathew-succession body that descends directly from the Old Catholic Church of Great Britain established in 1908. It neither claims to be, nor is, any part of the succession or work of Mgr. Vilatte. Nor does Mgr. Thériault produce any evidence that Mgr. Côté asserted otherwise. According to the published Apostolic Succession of the L.C.C.I., Mgr. Côté resigned from that church in 1982 and it would appear that he continued his work independently thereafter, notwithstanding his declining health (he was to have just four more years to live). From these modest foundations, Mgr. Thériault’s present church has been formed. It is worth considering that, were Mgr. Thériault’s assertions to be accepted, the L.C.C.I. might well have made a valid claim to the relevant jurisdictions, since Mgr. Côté was, as a bishop of the jurisdiction, under its canonical obedience and subject to its authority. As it is, Mgr. Thériault’s certificate of consecration by Mgr. Côté bears the heading “Ordinariat des Vieux-Catholiques Francophones d’Amérique – Rite Catholique Chrétien” and the important subtitle “Etabli au Wisconsin en 1889. Rétabli en Québec en 1974.” (our emphasis). Again, this shows that what we are dealing with is a modern reconstruction movement and not an entity with continuous jurisdiction from its claimed origins. Much is made of the involvement of various laity of the Durand and other families in Mgr. Thériault’s church. Worthy though this involvement doubtless is, the canonical continuation of a Catholic church is hierarchical by nature, resting upon clergy in the Apostolic Succession rather than the laity, particularly in the absence of any continuing corporate entity that establishes a historical continuation with the past. It is because Mgr. Thériault is not in Mgr. Durand’s episcopal succession, and because his claims to succession from Mgr. Vilatte are so tenuous, that his position must be regarded in such a critical light. In the recent past, Mgr. Thériault has maintained what we regard as a wholly unofficial representation of the San Luigi Orders and has conferred the Order of the Crown of Thorns and the Order of the Lion and the Black Cross upon various people. His authority has never been accepted by any of the representatives of the San Luigi Orders in the United Kingdom, nor is it accepted by us for the reasons we have given above. We should also note that these Orders appear to have been merely operated as divisions of his own church without serving any obvious external charitable cause. On 10 June 2011, Mgr. Thériault issued a Proclamation making his representation of the San Luigi Orders indefinitely dormant, and citing as a reason the lack of support at his convocations. It was only after the launch of our own website in May 2012 that he issued a further document rescinding this decision and resuming his earlier position. It is difficult to escape the impression that this was a mere reaction to our own acts. We note that we have, on an extremely full website with ample historical and explanatory documentation, given a full account of the succession and history of the Abbey-Principality – indeed a much more comprehensive treatment than Mgr. Thériault has ever managed – and we do not propose to labour these points unduly here. Suffice it to say that the document issued by Mgr. Vilatte on 25 May 1923 is conclusive with regard to the succession from him. Moreover, the Royal Charters and Letters Patent of H.M. the Omukama of Bunyoro-Kitara, and the Letters Patent of H.M. King Peter II of Yugoslavia, are displayed prominently and need no further explanation; whatever arguments may be made concerning our history, these are documents issued by two monarchs, reigning and unabdicated respectively, both in full possession of the fons honorum, and therefore they validate our claims in toto. We should also note that our history so far as Great Britain is concerned is fully continuous, with an unbroken succession from Mgr. John van Ryswyck in the 1950s through to our present Grand Prior for that jurisdiction who is his direct and lineal successor in that office. In his Statement issued on 26 June, Mgr. Thériault appears to regret that his own previous approaches to H.M. the Omukama and his representative in 2010 did not result in the recognition of his claims by the Kingdom of Bunyoro-Kitara. With hindsight, we must reflect that this decision by H.M. the Omukama was one of considerable wisdom. Mgr. Thériault further presents us with the unedifying and absurd spectacle of the prelate of an obscure Canadian church taking it upon himself to criticize the actions of a reigning monarch and fons honorum. In conclusion, it is patently clear that Mgr. Thériault cannot attempt to attack our position without thereby making his own even more vulnerable. Mgr. Thériault also goes on to announce a brand new “revised” edition of his 2006 book to be published in 2012. We rather doubt that this will be any more commendable a work than its predecessor. In a further document of 22 July, Mgr. Thériault lays great emphasis on an alleged statement by the former Prince-Abbot Louis-François Giraudot, seemingly made many years after his resignation of office in 1899. This statement is untrue in several aspects. Mgr. Vilatte did not “maintain a discreet silence” on the subject of the Abbey-Principality. Indeed, he referred to it throughout his episcopate in several publications (the 1899 OLBC Statutes, the 1900 OCT Statutes, and the 1922 History (which gives the fullest account of the Abbey-Principality)) and issued brevets as Prince-Abbot including numerous appointments to the Order of the Lion and the Black Cross which owed its existence entirely to the Abbey-Principality. Mgr. Giraudot was listed as a Patron of the OCT in its 1922 History, and clearly had felt no qualms at being involved on not one but two occasions (1896 and 1899) in the transfer of the authority of the Abbey-Principality before the attestation of M. Clairet, the Mayor of Seine-Port and therefore an official of the French Republic, an act which had the force of law and in which any fraudulent misrepresentation would have been duly punishable. We do not believe that there is value to attempting to debate with Mgr. Thériault when his mind is so clearly set against the facts of the matter and where rational thinking is so patently absent from his published Statements and other writings. We had hoped, clearly in vain, that there would be some scope for co-operation between his representation and the Abbey-Principality, as we have always been ready to offer the hand of friendship and to collaborate in fraternal Christian charity, and we do not consider historical arguments to be sufficient grounds for division among those who serve our cause. We also continue to welcome any persons who have received what they believed in good faith to be the San Luigi Orders at his hands and who wish to transfer their allegiance to the proper representation of those bodies under us. In conclusion, we state that it has not been through any wish of ours that we have been compelled to enter into this controversy, but solely through Mgr. Thériault’s decision to discuss these matters in the public forum. We exhort our members and friends to pray for him and his church, that they may in due course be led to that ineffable Light that is itself Truth. The present Prince-Abbot of San Luigi is also in succession from Mgr. Côté via his only consecration for the L.C.C.I. in 1979 – arguably the only consecration that he undertook with appropriate canonical jurisdiction. This is a senior descent to that of Mgr. Thériault, who was not consecrated until 1982. Persson, Bertil, email communication to the author, 11 March 2012.